I have been using eRDF lately to annotate my own posts, so I try to link to resources descriptively. The problem I often have is to find URIs for ‘concept’ resources that resolve to an html page because I don’t want to send people off to an RDF/XML page. You are right, the results of the plugin on your blog pages really are impressive! There is a lot of potential in this plugin. Semantic Web is now, it’s time to show it to the people!! Here is a link to the page you expose in your comments above. Note that we Sponge for eRDF and RDFa in our Browser, SPARQL Query Builder, and Query Processor. Each of these exploits the fact that our Sponger Mmiddleware (non RDF to RDF) is exposed as a REST Service (same applies to Zitgist which is also Virtuoso based). When you look at your data via the “Browser” or “Raw Triples” tabs you will notice that all hyperlinks are based. Thus, offering “Explore” (in- and out-links) or “Dereference” (out-bound links) Linked Data traversal routes. Will the plugin be able to work against any (configurable) SPARQL end point? Nice post by the way; the main idea was similar to the current one. Yeah, it is the same idea. As we can notice with Keith and Your’s comment, the idea is not totally new 🙂 However now we have the technologies to make it working just fine. It is a primal implementation of the idea, but much more can be done in that direction. Tom Morris posted a similar suggestion as a comment to my last post (which I am gratuitously linking to here to see how the link will look 🙂 ). I suppose I could do – but I would need two links, one pointing to the RDF, with semantic annotation, but no clickable text, and another visible one for the human readers, which would go to the RDF browser. This is sort of what I do now, except that I can usually make the “human” link point at a homepage or something, and semantically annotate that link too. Or – just a suggestion – you could make the HTML of your RDF browser GRDDLable, so that a fragment identifier at *your* html representation of the resource could act as a surrogate for the machine-readable one (with, say, an RDFa owl:sameAs link to the original ) – and of course if you render all the properties with RDFa, then they will show up in your blog’s link preview when you link to them. Yeah, this is planned that I try some things in that direction: including RDFa things into the generated HTML. However, one of the problem we will soon face is the following one: the next version of the browser will be highly ajaxified for performance and usability purposes. What it means? It means that the only 20% to 40% of the browser page will be full “html”. The remaining of the page will be fetched and created by JS scripts. So, the consumer of that kind of data will have partial RDFa, and only full if it render JS code as well. BUT, plugins such as Operator, that have access to the DOM tree of a document, will be able to do his work with the generated document. This is really nice that you tried that experience by yourself! This is exactly what I hoped. Another way would be to make a link to your own URI link this. What about doing content negotiation, for that URI, such that it 303 redirect to here. That way, users following a link to your URI would see a HTML page if the requested mime is a web page. Any thought? Take a look at what I have done with my own URI. request “text/html” or “application/rdf xml” using CURL to see what I mean. What about a release of this plugin? I think it’s one of the clearest way to show the content negotation issue and the resource and its various rapresentations!! Well, I am waiting for my plug-in account approval by the WordPress crew. So it should be available at wordpress.org as soon as I get approved. In mean time I sent it to you by email. Sorry for the delay, but I just found that your comment was waiting for moderation (I didn’t receive any email notification, dunno why). 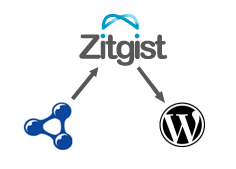 If you take a look at the plugin, it currently use a Zitgist web service. So, I don’t see why you couldn’t hack the plugin to put your own web service in there. IN fact, the WordPress plugin is only used to display information comming for Zitgist. I’m really interested in this plugin and the elegant solution overall. The implemented plugin seems to need some additional configuration though, because it has eaten all my site links and provides no response. I have the lovely icon and when hovered they show a ‘working’ gif, without results of any kind. Please let me know if I need to make changes in the plugin. Yes it consumed all your links; Eventually we could add an option so that bloggers can choose what icon to put where. The WordPress plugin for zLinks is “on ice” for now (no new development planned). However, it should be upgraded soon (comming weeks/months) because of some work with are doing on other projects. Also zLinks will be re-invented with a new incarnation at some point in time. 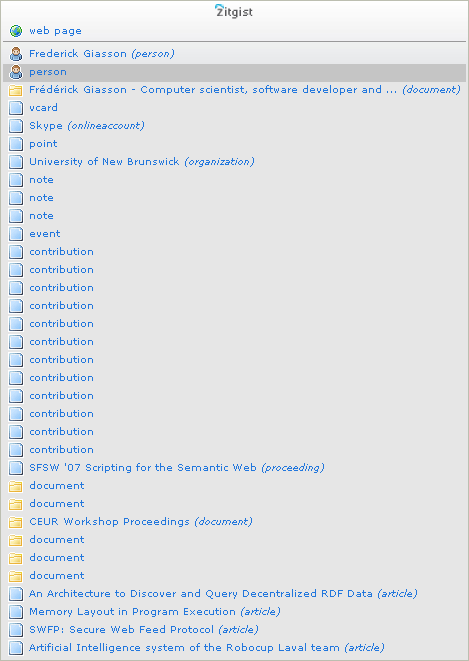 This plugin is still working, but the problem is the poorness of the rdf (linked data) available for most of the links (it is why not much is shown when you over most of your icons).